Rao's "Ready to Serve" Roasted Peppers are fire-roasted, peeled and seeded. Sweet golden raisins, pine nuts, oil and garlic are added to create a unique recipe that has been handed down from generation to generation from our family to yours. 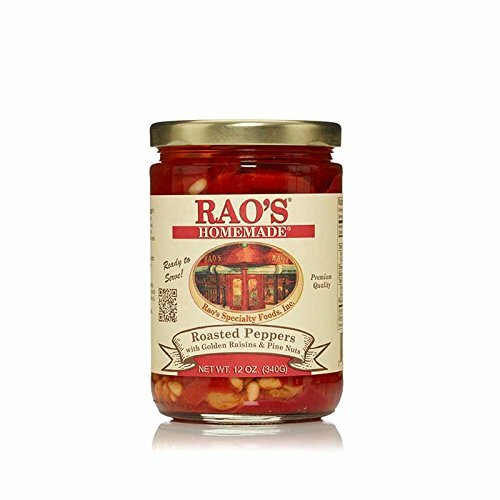 Rao's Roasted Peppers are made with roasted red peppers (peppers, water, salt, citric acid), canola oil, golden raisins**, sugar, pine nuts*, olive oil, fresh garlic. ROASTED RED PEPPERS WITH PINE NUTS: Our ready to serve roasted red peppers are fire-roasted, peeled, and seeded. Our unique family recipe with sweet golden raisins, pine nuts, oil, and garlic, has been passed generation to generation, our family to yours. THE FINISHING TOUCH: The best way to craft traditional Italian dishes at home is to use quality Italian ingredients. Rao's Homemade is pleased to offer condiments, dressings, and sauces to give your cooking the taste of authentic Italian home cooking. CLASSIC, TRADITIONAL ITALIAN FOOD: Italian cuisine is more than spaghetti and pizza, and at Rao's Specialty Foods, we use traditional, artisanal methods to make delicious, homemade dried pasta, sauces, sides & vegetables, cooking sauces, & dressings. RAO'S HOMEMADE: Enjoy authentic Italian pasta sauce, dressings, and classic Italian condiments from Rao's. Each jar of pasta sauce is made from the finest, naturally ripened Italian tomatoes. We use natural ingredients, like pure olive oil and fresh basil. RAO'S QUALITY: Compare Rao's dressings, condiments, and sides with those from Prego, Barilla, Newman's Own, Emma Bella, Classico, Bertoli, Muir Glen, Cucina Antica, Hunt's, Organic Bello, Lucini, Ragu, Dave's Gourmet, Colavita, Beaufor & Francesco Rinaldi. If you have any questions about this product by Rao's Homemade, contact us by completing and submitting the form below. If you are looking for a specif part number, please include it with your message. Schwans Stilwell Southern Breaded Okra, 5 Pound - 4 per case.